Possible meanings of “Susquehanna”: muddy current; mile wide, foot deep; the long reach river; long crooked river; the place of the straight river. The basin drains covers half the land area of Pennsylvania and portions of New York and Maryland. Includes all or portions of 66 counties. Comprises 43 percent of the Chesapeake Bay’s drainage area. 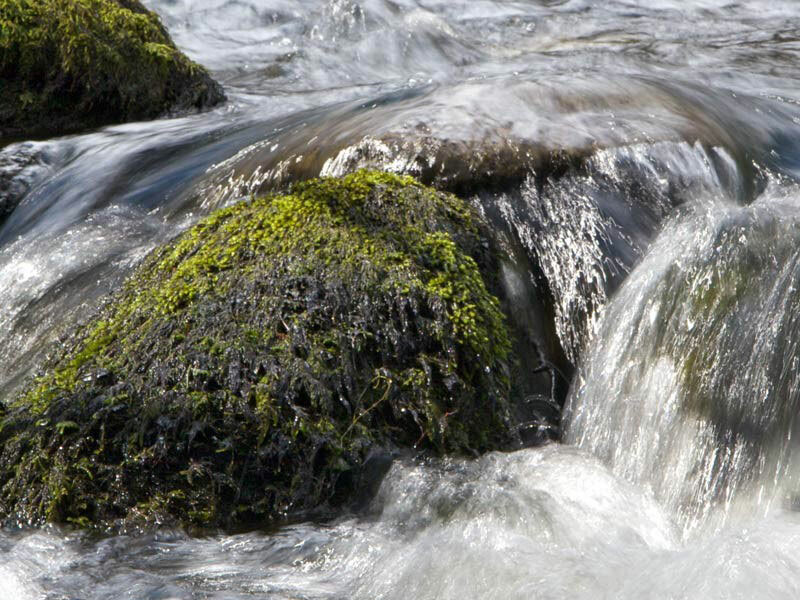 Has more than 49,000 miles of waterways – rivers, streams, creeks, brooks, runs, etc. Is one of the most flood prone areas in the entire nation, experiencing a major devastating flood on average every 14 years. The basin’s average annual flood damages is $150 million dollars. Is the longest, commercially non-navigable river in North America. 3.8 million people live within the watershed. The Susquehanna River, in its entirety, is the 16th largest river in the United States and is considered “Pennsylvania’s River” for its importance as a source of drinking water, recreation and hydroelectric power to millions of people in its watershed. The river flows 444 miles from Otsego Lake near Cooperstown, NY, through Pennsylvania and Maryland, before emptying into the Chesapeake Bay at Havre de Grace, MD. This river is responsible for providing half of the freshwater received by the Chesapeake Bay. The Susquehanna River Watershed encompasses almost half of the state’s land area—more than any other river basin in the commonwealth—while Pennsylvania makes up more than three-quarters of the basin’s total area. The Upper/Middle Susquehanna Region contains the largest sum of headwaters supplying the Susquehanna River Basin. Draining nearly 18,295 square miles, (including 6,275 square miles in New York) the Upper/ Middle Susquehanna Region in Pennsylvania extends from the confluence of the West Branch of the Susquehanna with the Susquehanna River at Sunbury north to the Pennsylvania/New York border. With a drainage area of nearly double that of the Lower Susquehanna Region, the Upper/Middle Susquehanna Region supplies the main stem of the Susquehanna River with headwaters originating from past-glaciated highlands combined with clear and cold mountain streams. 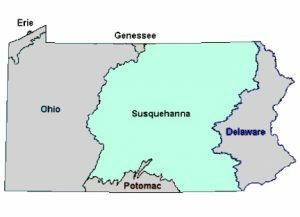 The Upper/Middle Susquehanna Region and its headwaters are located in some of the largest and most densely forested areas in the state. The region is recognized for containing eight of 15 counties within the Pennsylvania Lumber Heritage Region. These forested areas are important to water quality. From its northwestern boundary along the Nittany Mountain range and its eastern extent at the Schuylkill River south to the Chesapeake Bay, the Lower Susquehanna Region drains nearly 9,215 square miles of land (including 275 square miles in Maryland) and includes all land contained in the Lower Central Susquehanna, Lower Susquehanna, Upper Juniata and Lower Juniata sub-basins. This region is home to more than 2.5 million people—more than half of the population for the entire Susquehanna River Watershed. Sunbury in Northumberland County demarcates the boundary that separates the upper and lower regions. It is here that the West Branch of the Susquehanna River meets the river’s mainstem, creating the Lower Susquehanna River which flows 103 miles before emptying into the Chesapeake Bay. One of the more prominent features of this region is the Appalachian Mountains. Nearly all headwaters originating in these mountains flow into the Juniata River, eventually reaching the Susquehanna River near Duncannon in Perry County. The Susquehanna Region has a moderate climate, lacking long periods of extreme hot or cold weather. A majority of the basin has a minimum temperature of 12 to 19 degrees Fahrenheit and a maximum temperature of 78 to 85 degrees Fahrenheit. Average annual precipitation for most of the basin ranges from 34 to 43 inches per year. Normal rainfall amounts are generally enough to support the vast agricultural lands of the region without irrigation. Almost half of the basin’s annual precipitation falls during storms between May and September, the primary plant-growing season. The remainder precipitation, including snowmelt during the winter months, infiltrates the ground and recharges groundwater reserves.